#TLConf2015: Is your PBL Up to Gold Standard? Is Your PBL Up to Gold Standard? As with my last post, this is mostly in notes format. It’s late, and I’m tired, and I know if I don’t just post it now I never will! There might be typos, and not everything will be sentences. So, no judging! So, what is the gold standard of PBL? How can we design gold standard projects? Need-to-know questions. Design projects around what kids really need to know. Design instruction around what you anticipate what students need to know. One way to sustain inquiry is to ask the students what they need to know. The goal is to make PBL the main course, not the dessert. Rhonda and Ashley handed out an article on essential project design elements (it will be on bie.org some time this week, and I’ll try to remember to link it here when it’s up). She split us up into teams and assigned us sections. We then created posters that defined the element, gave evidence from the article, and incorporated a visual aid. 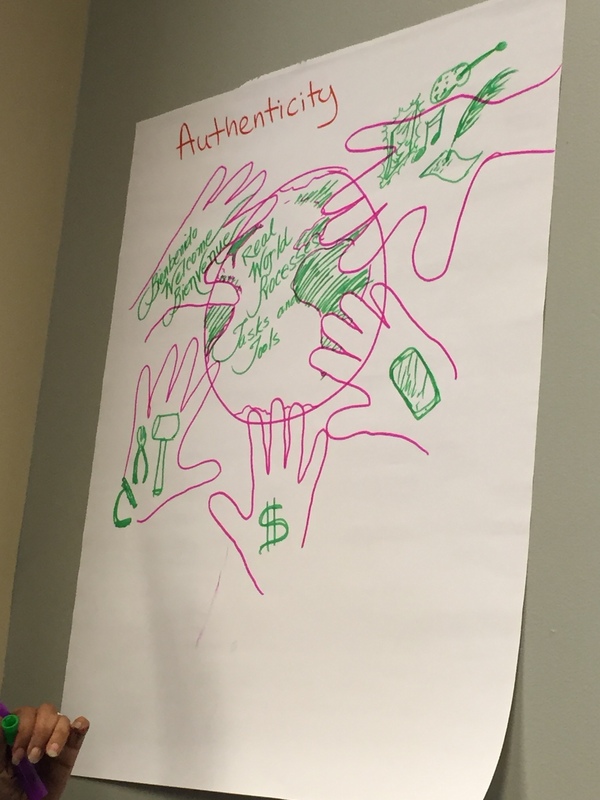 Since our group focused on authenticity, we drew a word with lots of hands around it. We added things like microscopes, music notes, phones, and more to take a look at some of the authentic tools we can use when designing a great project with PBL. You can see our beautiful poster below! I meant to take pictures of all the posters but forgot. C’est la vie! This is one of the hardest things for teachers to do in a project. We sometimes answer our own questions because the kids might not answer them right away. Important! Need to know list should be the first step in inquiry. That sets up the questions and helps sustain the questioning/inquiry. Some teachers are not comfortable with relinquishing some control. But remember, we have the background decisions; the teacher designs the bigger problem and allows for some choice in getting there. carry on throughout your life. If you really want to learn from your experiences, you need to think about them. kids feel good that people actually care enough to see what they have done. give them these opportunities! Check project design rubric on bie.org to make sure your project design is solid. If we want our kids to care, we have to make sure what they’re learning is authentic and relevant. Projects need to be rooted in standards and success skills. start w/ low stakes. Give them things they aren’t graded on! Yay; this validates my own philosophy and instructional choices! Manage activities- put structures in place that our students know where to do. Can still use direct instruction in PBL; it does not go away. Use mini-lessons to jump in with direct instruction when they need it. Be sure that the product is truly an opportunity to show that they have solved the problem or answer the question, as well as an opportunity to demonstrate mastery of content standards. PBL can be a way to create conditions for perseverance. Don’t forget to check out bie.org! They have everything you’d need to design a project on the web site (and it’s all free and downloadable!). They also have a project library of hundreds of projects that teachers have designed and implemented. This could be a great way to start brainstorming ideas and coming up with PBL topics. BIE signature product: 3-day workshop to help teachers design PBL projects. If you are an instructional leader and you want to have your staff do more PBL, this could be a fabulous resource for some relevant PD! I learned a ton in an hour; I can’t imagine how much I’d learn in 3 days! Thanks, Rhonda and Ashley, for a terrific session! I can’t wait to design a project using your methods!